For cleaning chemical companies, their goal is to provide solutions that help to create a clean, hygienic and healthy environment. The use of chemical concentrates has environmentally friendly benefits, as there are lower transportation costs and fewer packaging materials as opposed to transporting spray bottles. For example, approximately one litre of concentrated chemical is equivalent to 75 spray bottles. However, despite the benefits, the way in which customers dose and dilute these products is important. Chemicals in their pure form are hazardous, as spillages and exposure can lead to potential injuries. To prevent this, using chemical concentrates in a safe and reliable way is key. This comes in the form of chemical dispensing systems. What is a chemical dispensing system? A chemical dispensing system is a piece of equipment that doses or dilutes chemical at the point of use. Choosing to dilute chemical concentrates at the point of use and sourcing water on-site, reduces transport costs and carbon emissions. In addition, using chemical dispensers provides accurate dosing. This minimizes chemical wastage, providing cost-in-use benefits and ensures quality cleaning results. Today’s market offers a variety of chemical dispensing systems and the choice of which to use always depends on the business need. Brightwell Dispensers offers businesses a variety of chemical dispensing systems, from dosing one shot of concentrated chemical to diluting up to five chemicals using mains water. For customers who use a variety of chemicals, ECOMULTI is ideal. ECOMULTI is a one-stop cleaning station, allowing users to dilute all their chemicals from one place. 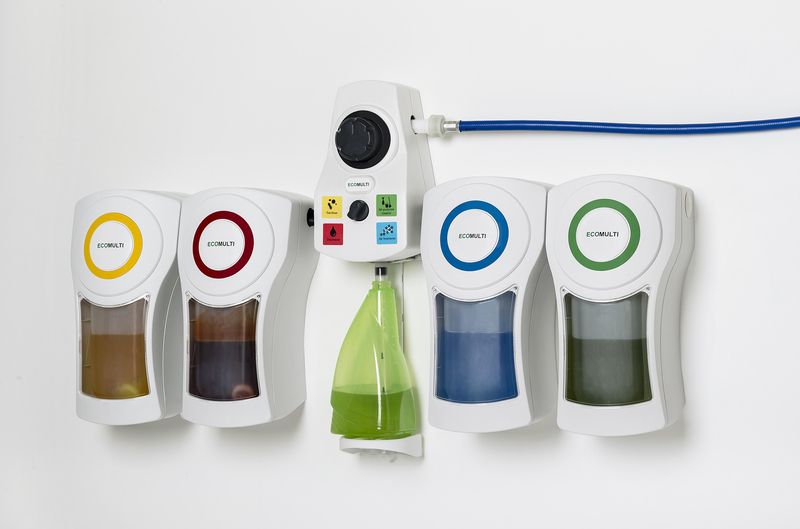 It dispenses up to five different cleaning chemicals from one system, making it easy to use and manage. At the push of a button, your chemical is ready to use. If using multiple chemicals, the dispenser comes with clear, colour-coded signage that shows which chemical to use for each application for easy training and maintenance. As chemical dispensing systems accurately dose the correct amount of chemical, this benefits businesses as it makes it easier to forecast cleaning costs. Businesses can control the consumption of chemicals and monitor how much they use. A chemical dispensing system is a cost-effective alternative to using ready-made cleaning solutions. They are better for the environment, efficient and make cleaning easier by providing safe and accurate dosing. Contact us for more information about our ECOMULTI dispensing system.